I struggled with acne as a teenager and again as an adult. I have seen doctors and two different dermatologists none of whom have been able to successfully resolve the issue. A friend recommended that I try finding a facial therapist and that is when I found Nataliya. When I first saw Nataliya my skin was particularly active but by the time I had left her it was much calmer. We discussed my diet and Nataliya made me realise that I was eating hardly any protein, which was crucial for my skin to begin to heal. She also recommended supplements and I went home with a number of creams and powders (the Spot Solution was only a “powder” back then but now it converted to the real product https://www.nataliyarobinson.co.uk/product/spot-solution/ ‎) with guidance on how to use them. The difference between Nataliya and other skincare professionals that I have seen is incomparable. I can (and have!) 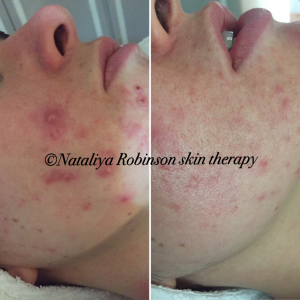 contacted Nataliya on numerous occasions outside of treatments. She always responds and is full of useful, practical advice. Besides that, Nataliya has a genuine interest in doing all that she can to improve my skin from the inside out. As she has pointed out, there are no miracle cures or quick fixes but in the five appointments that I have had, I have seen a huge improvement. For Charlotte’s treatment plan in order to achieve a clear complexion we did not use any pharmaceutical drugs ( antibiotics, steroid creams, contraceptive pills, prescribed acne medication). The treatment plan was based on herbs and plants. Together our natural and holistic approach has helped to achieve remarkable results and now we are planning to ensure we reduce post acne marks and ensure her skin has an even and healthy appearance. Please keep an eye on Charlotte’s story to see more progress.